East African Jungle Safaris organizes day excursion trips to tourist sites within Kampala and neighboring towns. These day trips are meant to enable tourists and business people who are unable to go for long tours get a chance to explore a few areas of interest. Among the attractions to visit on a one day trip is Ziwa rhino sanctuary. You will wake-up very early in the morning and have a cup of tea and at exactly 7:00am you will be met by a company driver/guide who will brief you about the days travel itinerary and straight away embark on a 2 and 1/2hours drive towards the northern part of the country passing through the districts of Kampala, Luweero until you get Nakasongola district the proud home of Ziwa Rhino Sanctuary. It is 176Kms North of Kampala off Kampala – Gulu . This Project was founded by the Rhino Fund Uganda and Uganda Wildlife Authority with the aim of re-introducing Black and White Rhinos in Uganda’s National Parks. This sanctuary was established to breed black and white rhinos and restore their populations in Uganda’s protected areas at a later stage. The sanctuary is currently a home to 13 Southern white Rhinos. The sanctuary has overtime become a popular touristic site not only to trek the majestic animals but also an excellent paradise for bird watching, nature walks and just relaxation. Rhino tracking takes about 2hours in the company of well trained and knowledgeable local guides. 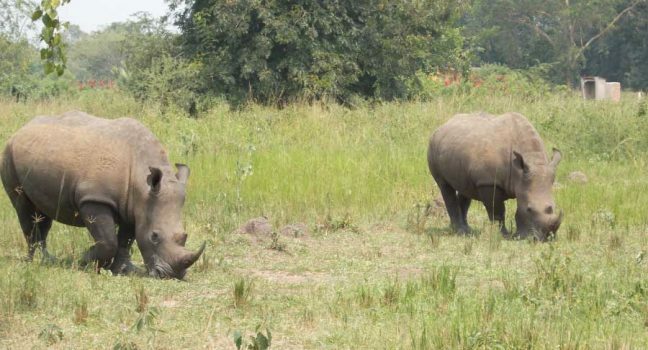 So after this great experience, you will head to the restaurant for your thrilling lunch and some refreshments, afterwards be driven back to your hotel in Kampala where you will reach late in the evening and you will be dropped at your hotel and this will mark the end of this 1 day ziwa rhino sanctuary.